What’s new in Ag tech? 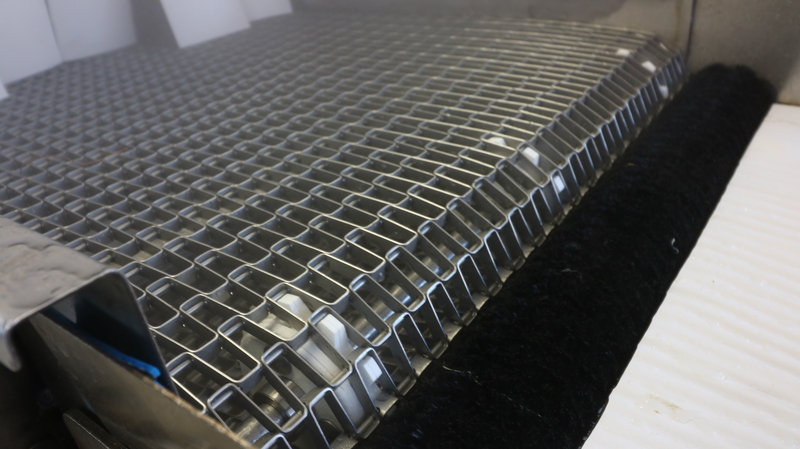 Well, one thing that we’ve recently discovered is a rinse conveyor. 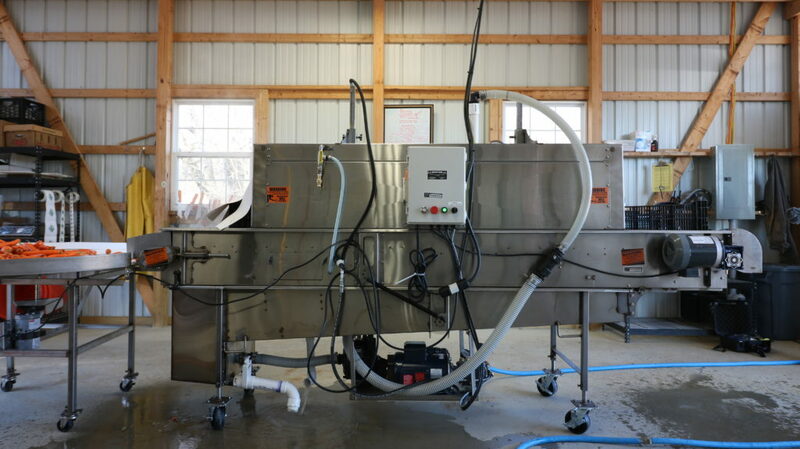 Specifically designed for the small-scale farm who wants to graduate from hand washing to something a little more automated that can really crank up the pounds of washed vegetables for market. This machine is made by AZS, an equipment manufacturing company in Ephrata, PA. It is available in full stainless steel, with adjustable water pressure and belt speed, available for under $7,000. 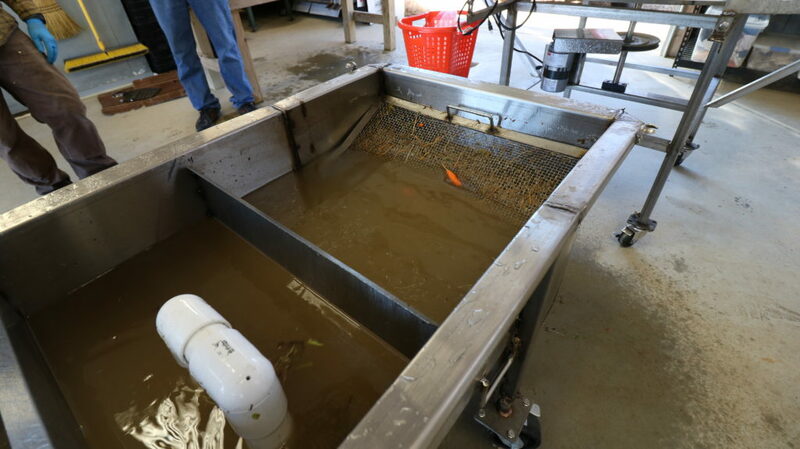 The rinse conveyor is a versatile machine and can wash everything from greens to root crops. 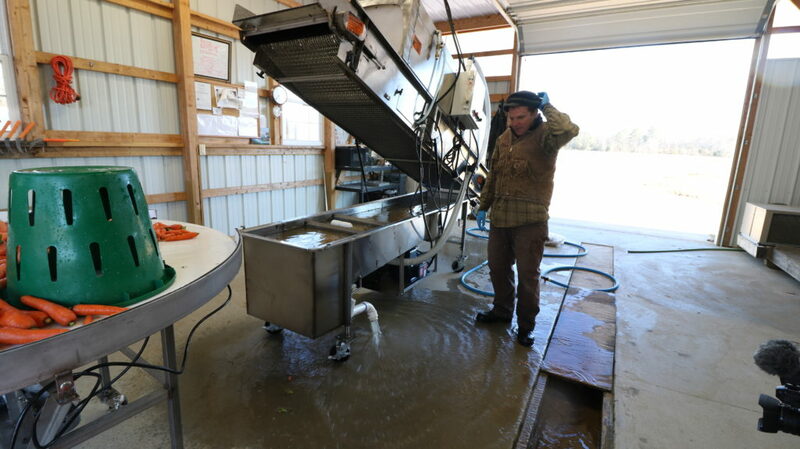 I watched it effectively clean sweet potatoes and carrots, but this machine is capable of washing loose spinach and even bunched vegetables or your harvest bins! Next a HIGH Pressure, LOW Volume spray. There are spray bars both above and below the products to blast the grime from both sides. The angle of the nozzles can be adjusted changing how fast the spray bars spin. The pressure can also be adjusted depending on your crop’s needs. A sweet potato can take a lot more pressure than spinach leaves. Finally, the product passes through a final rinse from some stationary nozzles mounted above. The product then gets to the end of the line and dumps on or in whatever you wish, commonly a sorting table. This machine is easy to clean and sanitize with smooth stainless finish and minimal nooks and crannies. 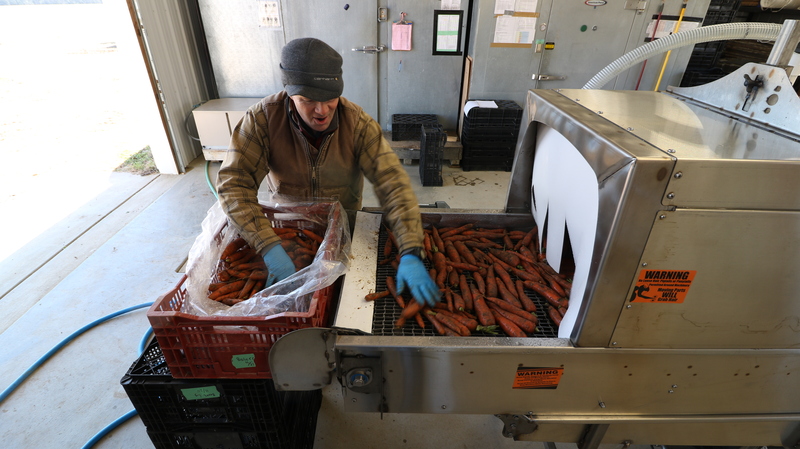 There is one brush at the end of the line to roll the cleaned vegetables gently off the line. I suspect this brush and the belt will remain pretty clean due to the fact that the belt is constantly being sprayed with water and the brush only touches cleaned crops. 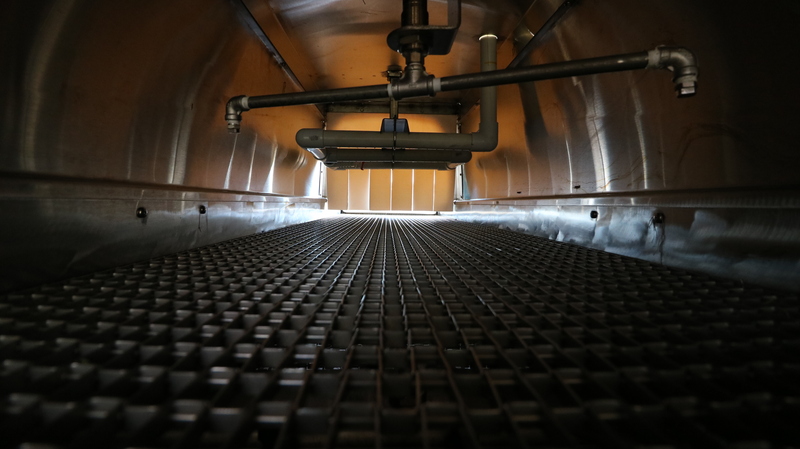 With smooth surfaces, and easy access this pieces of equipment looks like a good improvement in the eye of food safety and wash line equipment. Hinged and lifted via pneumatic cylinders to make cleaning access easy! The basin that collects the wash water does get recirculated. 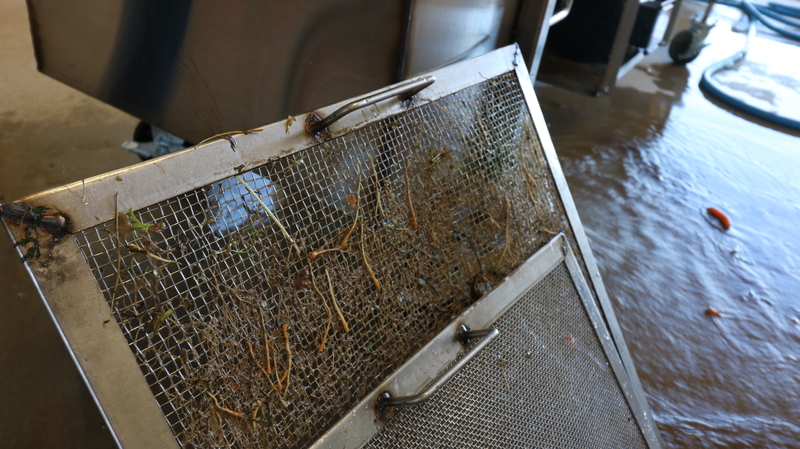 The wash water passes through a series of screens and baffles to settle out the sediment and debris before it goes back through the pump that supplies the pre-soaking, high volume/ low-pressure step. As with any post-harvest ag water, this would need to be monitored and treated in accordance with SOP’s. The high pressure and the final rinse steps are supplied with fresh incoming water. 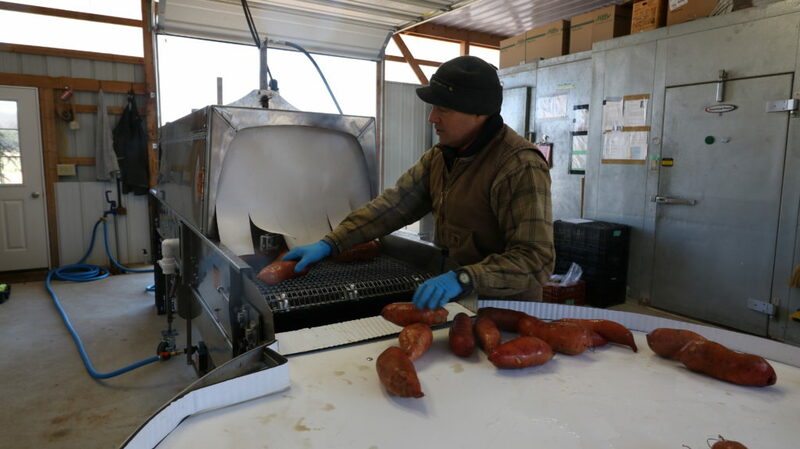 These pictures are from visiting David Paulk from Sassafras Creek Farm in Leonardtown, MD. Dave just started using this machine at the beginning of the year. So far he likes it a lot and is looking forward to really dialing in the optimum settings for the fastest washing of a variety of crops. If you missed it, check out the blog post from that visit here. David did a whole walk-through of how the machine runs and shares his opinions on it. We reached out to Will Reed from Native Son Farm in Tupelo, MS who received the same unit in December. His thoughts on the unit are shared in this blog post. We’ve been talking with several growers about this machine, as we are learning about it. 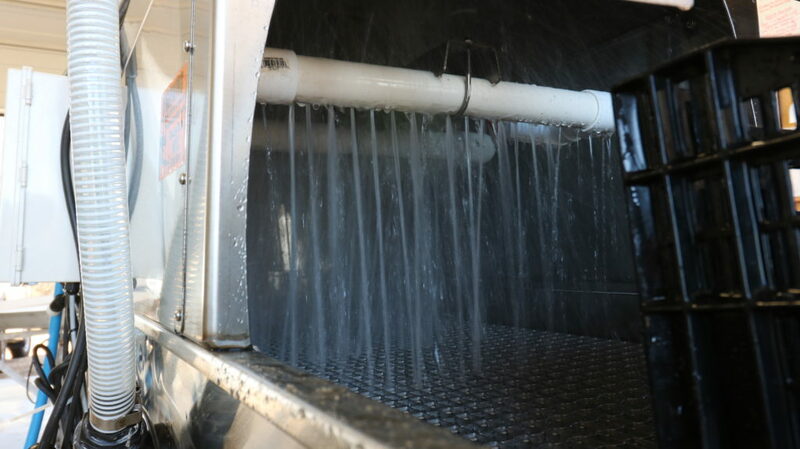 Some are seeing this as an alternative to a brush washer due to the ease of cleaning and sanitizing and we are seeing increased use through-out the region. We look forward to sharing further pros and cons of this machine as the growing season ramps up. The first couple of videos in this playlist explains how it works. The next ones show it in action. Finally, the last video shows how easy it is to clean it up once you’re done for the day. Do you know of any other similar pieces of equipment? Know of any other farms who have one of these as well? We’d love to get more input from other users. Shoot us an email. Thanks!